The new-build Novotel and ibis Melbourne Central is now taking bookings ahead of an anticipated opening on December 1, 2018. Towering above its prime location on Little Lonsdale Street, AccorHotels’ midscale and economy hotel brands will come together in the one property to offer travellers to Melbourne’s culture capital easy access to major dining, shopping and sporting precincts. Featuring 483 guestrooms, the 35-floor tower is AccorHotels Australia’s first vertical new-build multi hotel development where two brands will share guest facilities. Ibis Melbourne Central will comprise the lower tier of the tower and make up 270 premium-economy guest rooms, whilst Novotel will open from level 20 with 213, light filled, contemporary 4.5-star guest rooms and suites. Novotel and ibis Melbourne Central General Manager, Michelle Bradshaw, said food and beverage would be inspired by the city’s rich ethnic history, with Pretty Boy Italian Steak House giving a tongue and cheek flair to home cooked Victorian produce, along with Floyd’s Italian inspired spritz and salumi bar. For dumpling lovers, Goldie Asian Canteen and Brews will steam the stomachs of guests and locals alike and will be open from dawn to dark. “We’re so excited to be opening a purpose-built dual branded, vertical hotel complex, taking the midscale and premium-economy hotel sector to the next level, providing a fresh, vibrant and accessible destination to all travellers. The hotels will offer the latest in-room technology, exciting food, delivered by the best culinary talent in Melbourne,” she said. 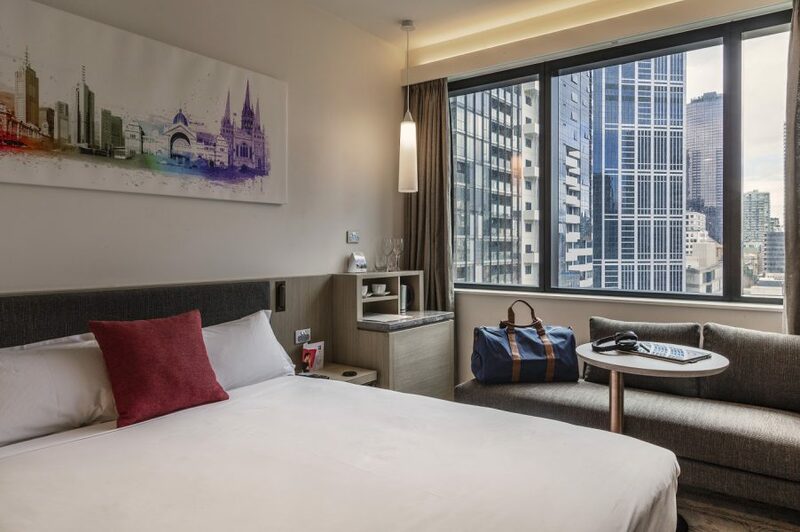 Novotel and ibis Melbourne Central is due to welcome its first guests on December 1, 2018 and opening rates start from AUD$186 per room per night.